Finally a product that stops concrete pond leaks once and for all! PondPro Concrete is the industry's one coat solution to concrete pond leaks. Unlike other systems on the market it does not require a primer or a 2nd coat. 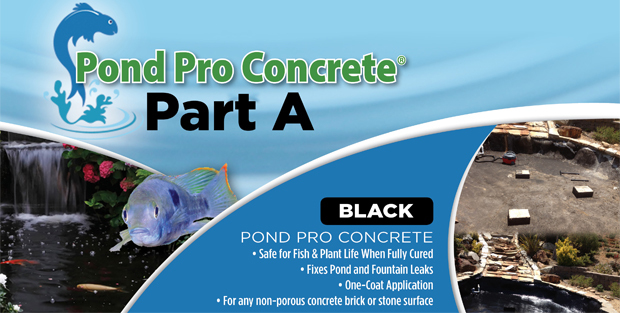 PondPro Concrete is not to be confused with a paint or other thin pond coatings on the market. PondPro Concrete is applied up to 10 times thicker than other products! Some products are coated at a 3 or 4 mil whereas PondPro Concrete is applied at a 30 mil about the depth of 10 pieces of paper. The distinct advantage of the product is in its unique chemical cure. The PondPro Concrete will chemically fuse itself to the substrate and any trapped air will be forced to the surface; leaving your pond with an airtight seal. The product comes in a gallon set; a gallon of Part A and a gallon of Part B. When mixed together this two gallon set will cover up to 125 square feet of surface area. Easy preparation steps: your concrete pond surface needs to be clean, dry and structurally sound. Any freshly poured concrete must be fully dry before application. We suggest not using any detergents in your Pond. A bristle brush and water is all that is needed. The pond surface needs to be clean enough that no dirt will be picked up with the nap of the roller or in the paintbrush used during the application process. Avoid cleaners and detergents as any remaining residue may harm your fish or plants. Only if your pond does not have fish or plants should you consider using cleaning solutions. As stated previously this is a one coat application of the PondPro Concrete. 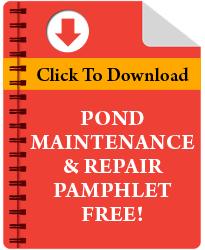 PondPro Concrete is specifically formulated for existing concrete ponds. PondPro concrete has been formulated to go directly over any previous sealants or coatings that currently exist on your concrete pond. Remove loose portions of existing coatings with a scraper and wire brush. Whatever coatings still have good adhesion may remain and coated with the PondPro Concrete. Any metal can also be coated but rusted or pitted metal should be wire brushed to remove loose oxidization. Tightly adhering corrosion may be directly coated with PondPro Concrete. PondPro concrete comes in two separate gallons you are getting a gallon of Part A and a gallon of Part B coverage per set is up to 125 square feet. Normal application rate is a 30 mil thickness which equates to about 8-10 individual pieces of paper. Mix only what you need and can apply in an hour as PondProConcrete® has a one hour pot life. Any unmixed material that you do not need can be stored for up to one year. For PondPro 2000® Concrete You will want to mix part A and Part B separately for 3 minutes then take equal parts of part A and Part B into a separate metal container or hard plastic bucket and mix for 3-4 minutes. You will need an electric drill, and a gallon mixer attachment for this. When mixing you want to be sure that the drill is creating a vortex. During the mixing you also want to bring the drill up and down and also in a circular motion so that the material is all distributed uniformly. Clean up is with either Xylene or mineral spirits. The most effective method of application is by a combination of brush, roller or squeegee. We suggest purchasing a good quality brush so the hairs stay in the brush. A roller should be a 3/8 inch roller. For large flat areas can simply pour out the material in a figure "S" pattern and distribute the material with a squeegee. For smaller ponds and verticals a paintbrush is the appropriate method. PondPro Concrete cannot get wet for the first 48 hours. One of the unique benefits of PondPro Concrete vs. other pond sealers on the market is the slow cure allowing it to get into the smallest of cracks and crevices. PondPro Concrete must be allowed to fully cure out for a minimum of 5 days at temperatures above 55 degrees before you fill your pond with water. If the temperature goes below 50 degrees just add that time to your overall cure time. We do suggest that the product is applied while your day time temperatures are at least 50 or above. 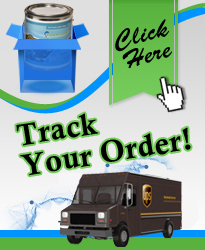 It can certainly drop during the night and this will not in any way effect the product. You simply need to wait until the next day when daytime temperatures reach above 50 for the product to continue to cure. Sunlight UV and humid will have no effect on the material. 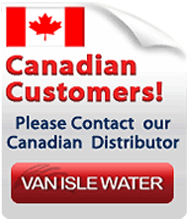 Note, some customers may experience a discoloration of the PondPro Concrete in certain areas once it is filled with water. This is normal. This can be due to a variety of factors, 3rd party coatings put over the concrete and/or minerals that have an effect on the PondPro Concrete. This has no effect on the performance of the product. As the pond water ages algae will automatically grow on the coating and the discoloration will not be visible. For those who do not wish to wait for the algae to grow, once the PondPro Concrete has dried (7 days) you can paint over the areas with a Urethane paint.